Bay Bed & Mattress - Locally Made Mattresses At Exceptional Prices! "When you sleep well, we sleep well!" 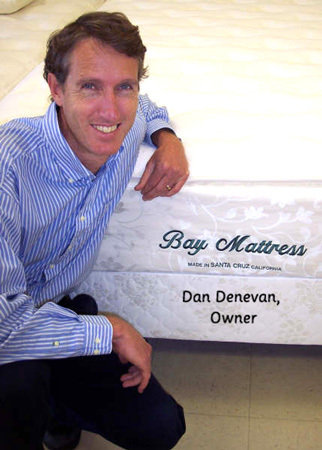 Bay Bed & Mattress is a family owned shop in Santa Cruz, California. We've been open since 1992. We have developed a reputation for outstanding customer service and quality products at every day low prices. We design and build our own mattress line, Bay Mattress, here at our shop. All of our Bay Mattress models have replaceable components. The innerspring unit, foam and latex layers, and quilted cover can all be changed by unzipping the mattress cover. This allows you to easily change the firmness of your mattress. A well made mattress starts with quality materials. Other manufacturers use low grade foams in their mattresses that break down quickly. We use talalay latex from Latex International. Latex is the most durable material available, provides superior pressure relief and is naturally resistant to mildew and dust mites. Our friendly, knowledgeable sales staff doesn't work on commission, so you can enjoy a relaxing, no-pressure shopping experience. Our focus is on helping you with your needs. We will build you a mattress that you will love. "Compare our locally made mattresses to any national brand - we build a better mattress for a lower price."